Hello lovelies, today I wanted to share with you my thoughts and beginning process for my Book of Me! This project is part of Rukristin’s Awesome Ladies Project and I am thrilled to be participating. So a few years ago I embarked upon One Little Word, and my word was Shine. I cannot lie and must admit that I dropped out of it, even though at the time I wasn’t able to really articulate why I stopped going on with it. I knew, however, that I needed a bit more – I needed to be able to delve a little bit deeper, process more, work more specifically towards healing. 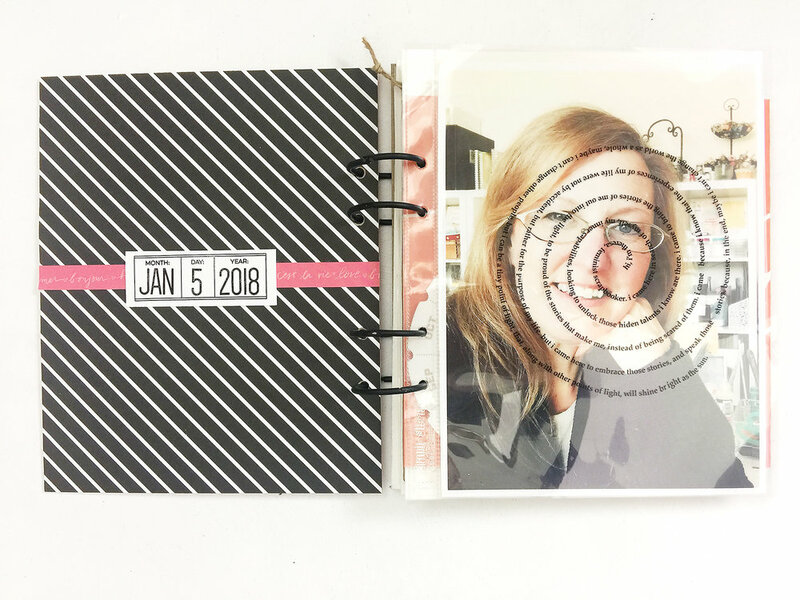 I have spoken in the past about my experiences as a survivor of abuse – both childhood sexual abuse and intimate partner violence – and I have shared a little of that journey in my Art Journal layouts. 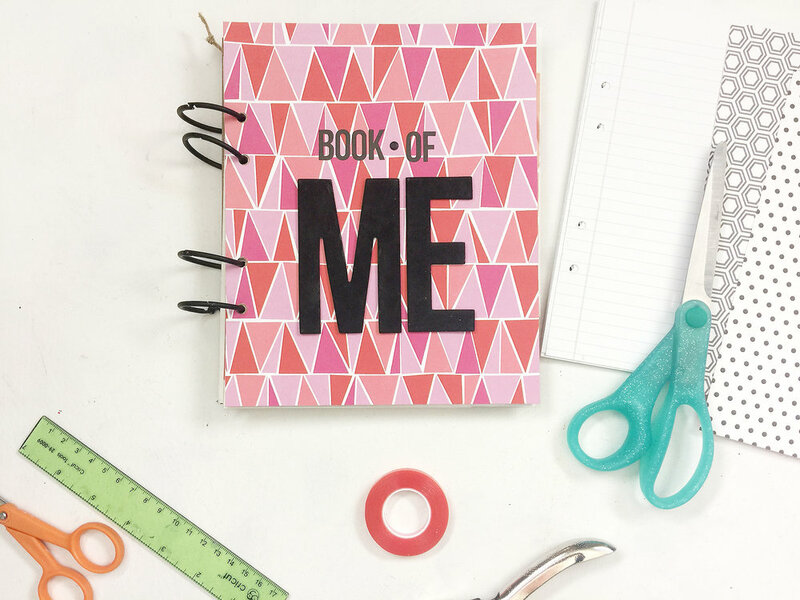 But several months ago I became aware of The Awesome Ladies Project, and have been specifically excited about the Book of Me project. So I joined the class, downloaded the workbook, and got to work. I was incredibly inspired by the simplicity of Kristin’s album, and so to keep my own uncomplicated, I followed her formula for the construction of the album. 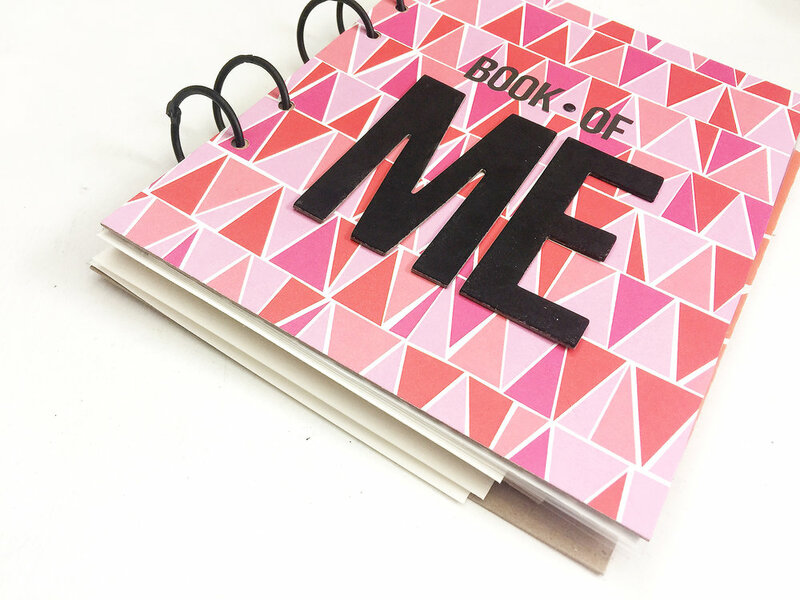 Binder rings, chipboard covers, and a variety of inspiring materials inside. I included this photo of me that I have taken as part of my In My Pocket class, and it also serves as part of the assignment for the Book of Me class as well. I also used the date stamp set from Elle’s Studio to add the date as a mark of where I am right here at this moment in time. Very simple, but very poignant things already happening in this little book! It actually surprised me a bit, when I read the words aloud I realized somethings I had been working through for a really long time. I spent a whole lot of time, as I think is completely normal, wondering why things had happened to me, why had my life gone the way it had gone, and what was the purpose? Through writing this simple journaling I truly realized for the first time that my journey is so that I can be the light in a really dark world. And together, you and I can light this dark world in ways that are so very needed. Already I am so happy I joined this project and am excited to share bits and pieces as the year goes on. I invite you to visit Kristin’s blog to learn more about this project and would love to see you join as well! 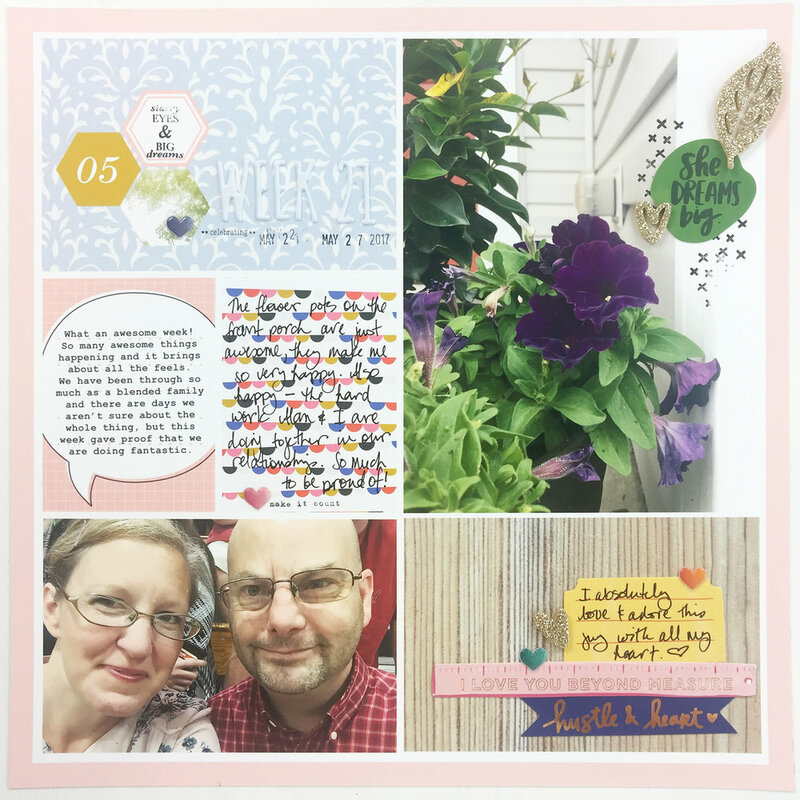 Project Life 2017 Week 21 | ft. Amy Tangerine Hustle & Heart!!! Hi guys! 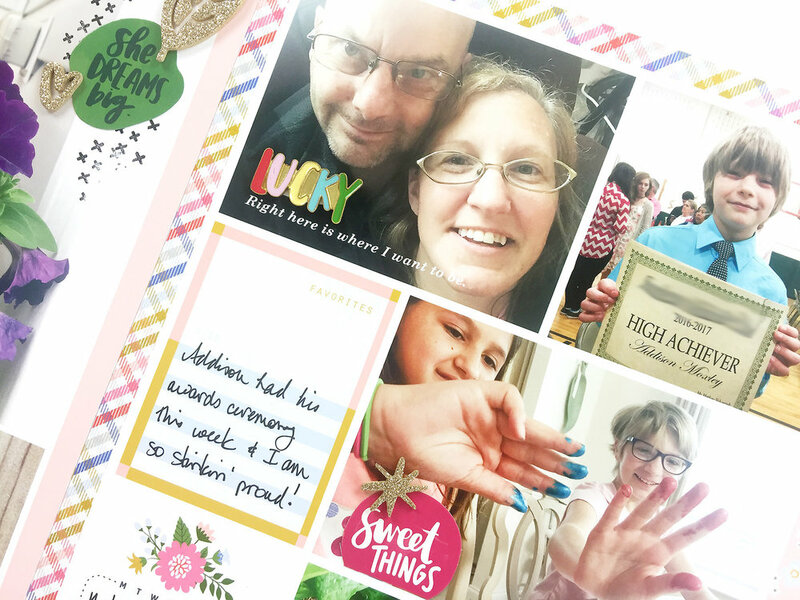 Today I am sharing my process video for my 2017 Project Life layout Week 21. 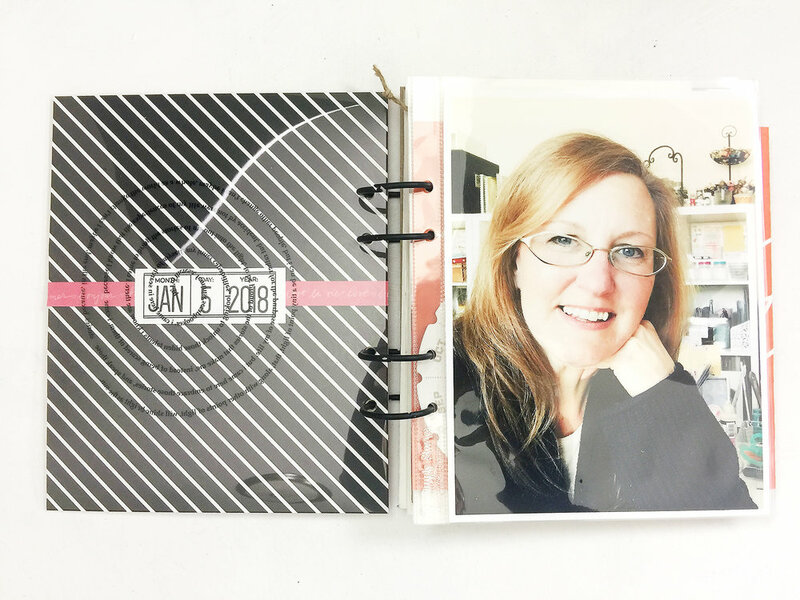 The digital layout was created in Photoshop using the Memory Pockets Monthly May kit called Fling, available at the link below. I then embellished the layout in this video, using Amy Tangerine’s brand new collection called Hustle & Heart! 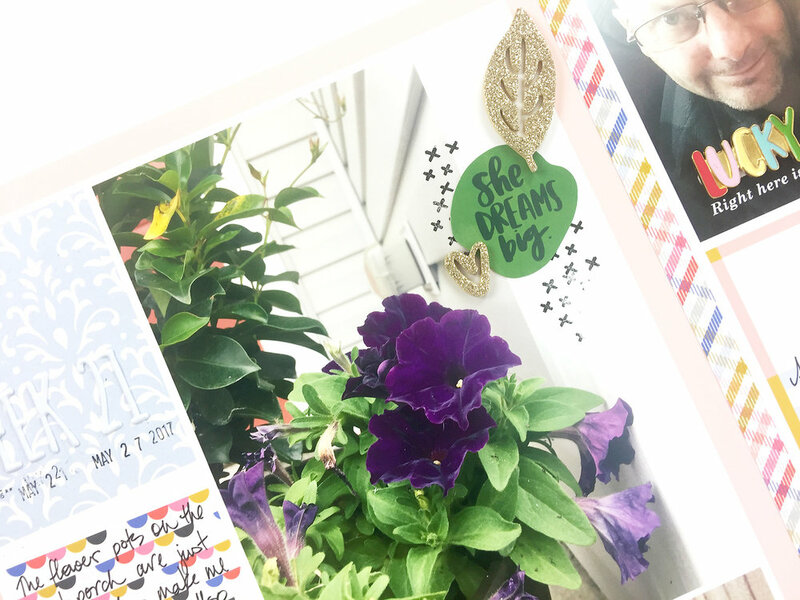 Our stories this week included my happy blooms on the front porch, Addison’s awards ceremony as he graduates from middle school, and the girls having some fun with paint and fiber! Always the best place to start – the date card. Mine is almost always at the top left hand corner, so let’s take a look! 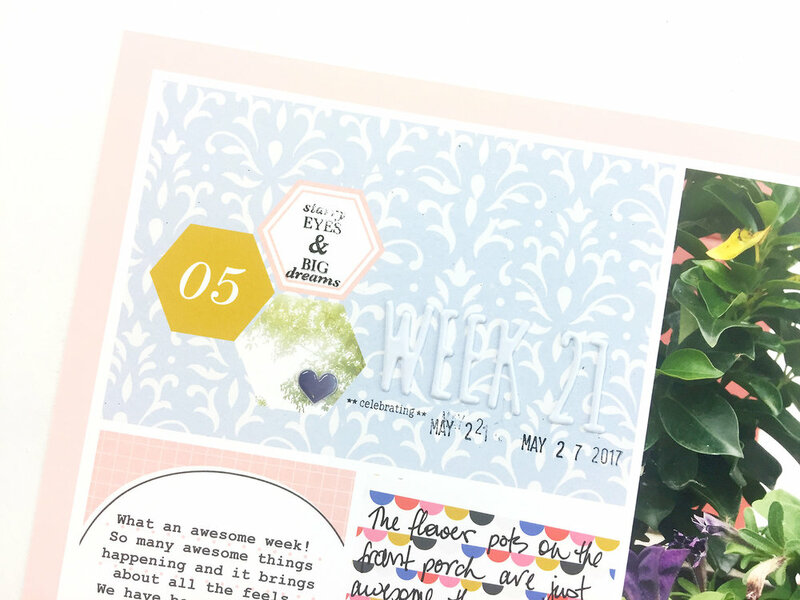 I used one of the add-on papers from Allison Pennington as the base for this card, and then added the hexagons from the May Fling kit prior to printing. Then I added my week number using the Amy Tangerine alphabet and I also added a few stamps. Very uncomplicated. I love this photo of our rich purple blooms on the porch, so I enlarged the photo for the layout here. The photo had this fantastic white space from the corner of the house, so I layered some embellishments there. Stamps first, then the die cut, and then gold glitter. That is a great formula for an embellishment cluster! I am continuing to include typed journaling and hand-written journaling on my pages, and love the added words on my pages. 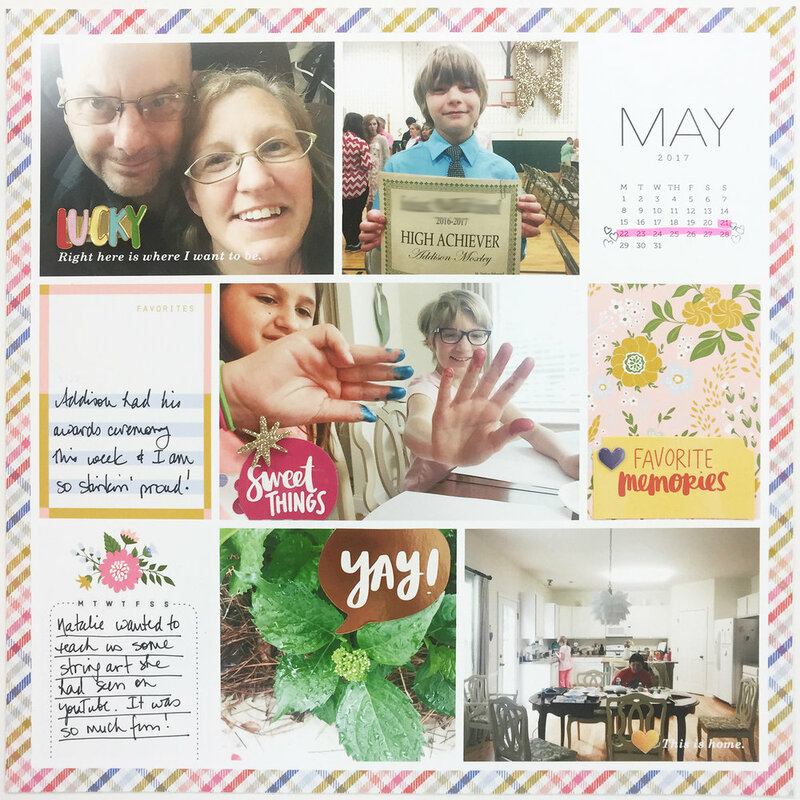 This was an important week for us, I felt like, as some days the whole blended family thing leaves us feeling unsure, not good enough, or any other number of hard emotions! But then there are days like this, where our kids succeed and we as parents take ownership of their successes too! We helped them achieve the success in their lives and so I am incredibly proud of all of us. 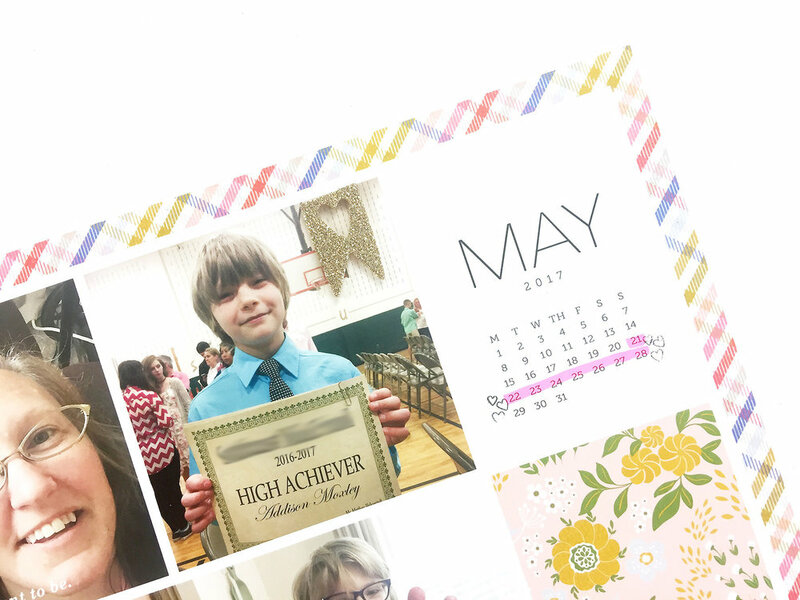 This is definitely a great way to document and celebrate that and I am so glad for Project Life! I love using a wood grain as a back drop for another filler card. 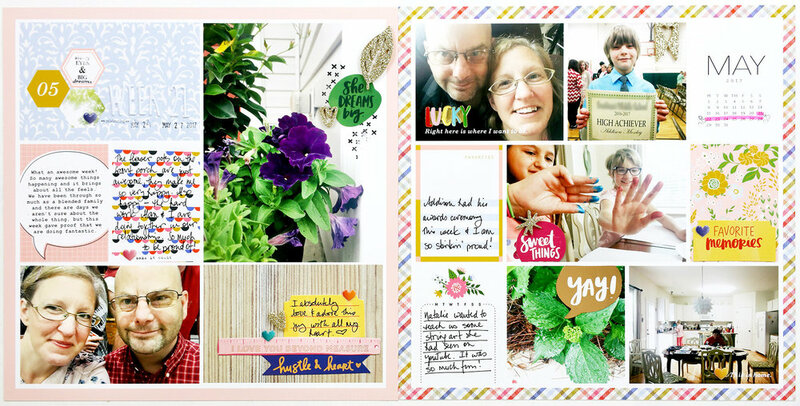 For this one I gathered the ephemera from Hustle & Heart to bring in all the colors – yellow, navy, and pink. All my favorites, ya’ll! Here is a closer look at the right hand side! Ok, so I know everyone always wants to know what is the must-have product, when American Crafts releases new collections? I will be the first to insist that you run, don’t walk, to grab the brand new enamel pin stickers!!! I could not wait to open them and used this Lucky one right away. In other flower news, our hydrangea bloomed and we are surprised and excited about that too! We had a really late freeze last spring and the hydrangea and the gardenia were not very happy about it. But they have proven to be resilient! I don’t know how we have managed to keep our flowers so happy in our little yard, but they are doing great and I love including them in my layouts. 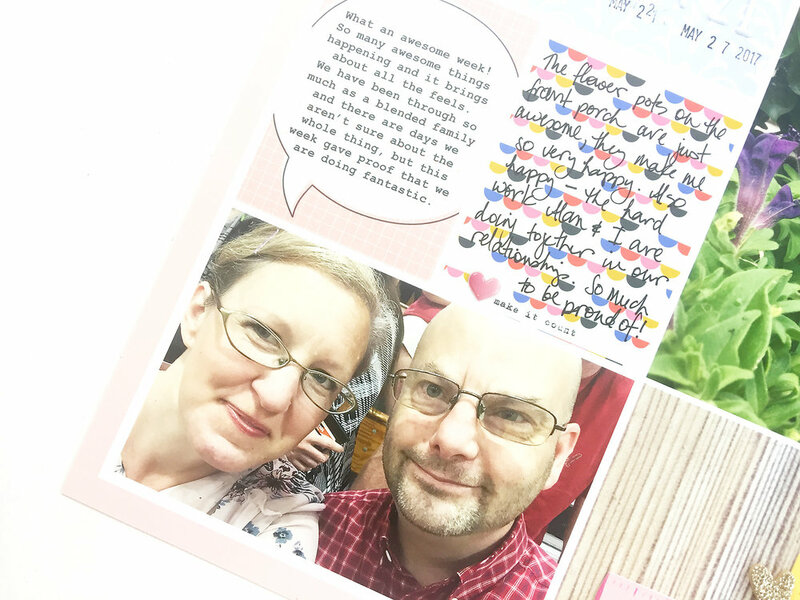 Did you notice my tiny blooper on my printed layout? 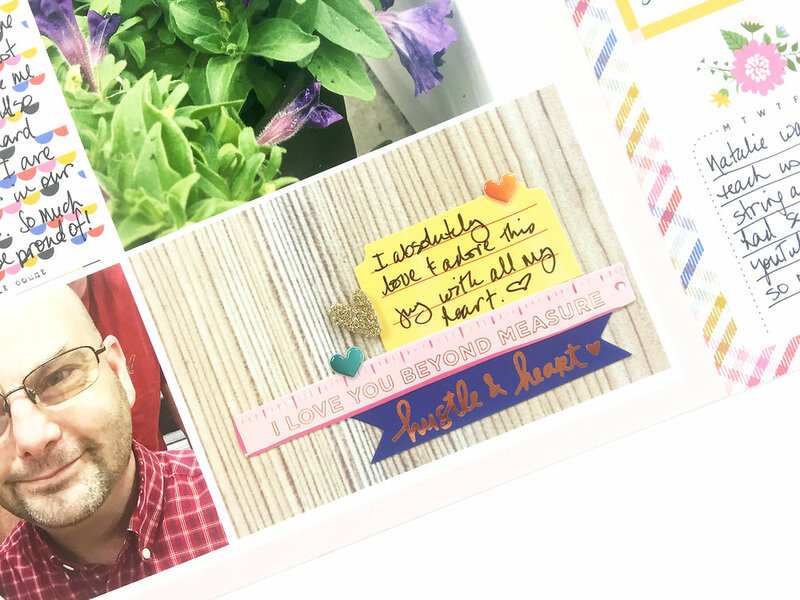 When I created the layout, there was a text block on this floral card and I forgot to either remove it or add text, so just random text was printed there! No worries, I added this die cut over top with a puffy heart and no one ever knows. 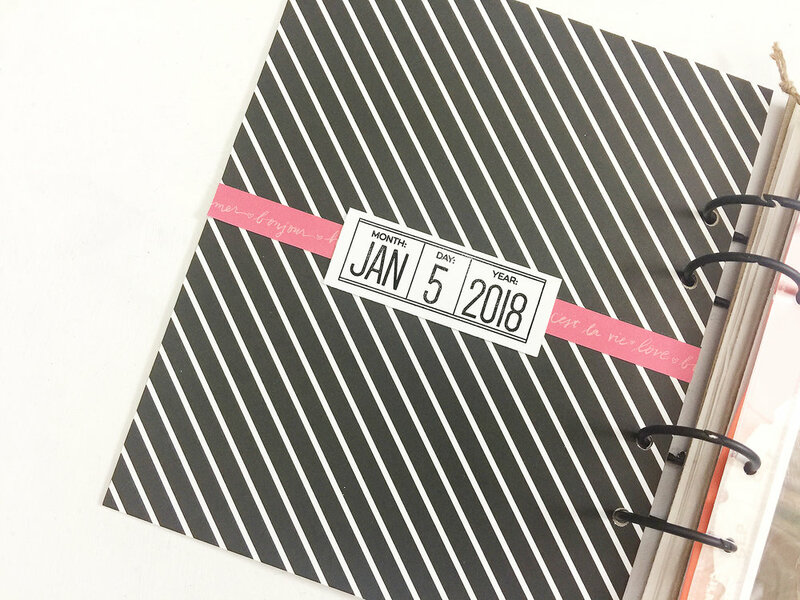 One more simple calendar card, which I have highlighted using a regular old office staple, my trusty highlighter!